How to read Axial Solid Tantalum Capacitors? List of Axial Solid Tantalum Capacitors. Axial-lead tubular hermetically sealed solid tantalum capacitors have proven reliability and performance, combined with low leakage current, high capacitance and low dissipation factor with very high stability over time. They can withstand high frequency vibrations from 55 to 2000 Hz at 20g with no internal damage. Plastic film insulating sleeve hermetically sealed withstand life test of 2000 hours at 85 degrees C at rated WDCV. 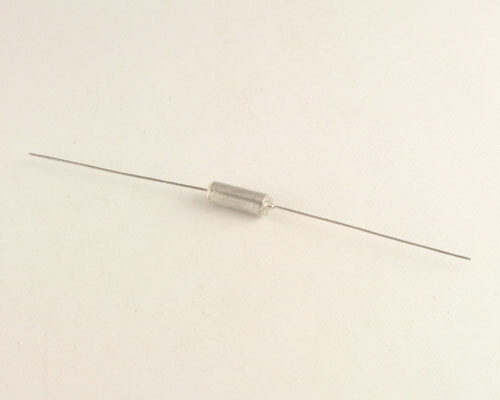 These capacitors have been proven in commercial, harsh environments of industrial and military applications. Solid tantalum capacitors are suitable for decoupling, blocking, by-passing, filtering and r-c timing circuits. Solid tantalum axial-lead capacitors come in voltage ratings of 6, 10, 15, 20, 35, 50, 75, 100 and 125 WDCV. They are available in 4 case sizes: A, B, C and D with capacitance tolerance of 5%, 10% or 20%. Case Codes (diameter x length [inch]).